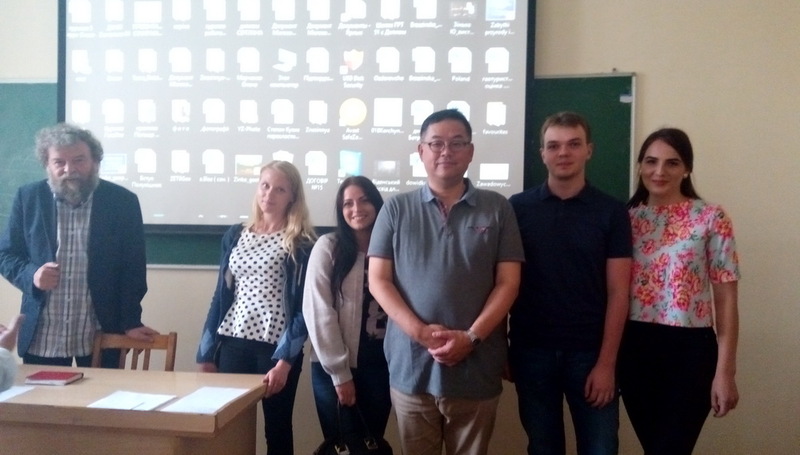 Professor Shinji Iwanaga from the University of Meiji Gakuin (Tokyo, Japan) visited Lviv University at the invitation of the Department of Economic and Social Geography of the Faculty of Geography. The Professor represents the Institute of Sociology and Social Sciences of the Tokyo University. He is a world-famous sociologist who lectures at the University of Sorbonne (Paris) and the University of Hamburg. On September 12, 2017, the Japanese Professor lectured on “Urbanization of Japanese Society after World War II” for staff and students of the Faculty of Geography. In the lecture, the scientist described the socio-economic challenges Japan faces with the growth of urban areas and the processes of globalization and decentralization. Also, during the speech and after-lecture discussion the transfer of Japanese experience in solving socio-economic problems in Ukraine were debated. У листопаді 2017 року передбачаються спільні дослідження професора Шінджі Іванаги з викладачами географічного та історичного (кафедра соціології) факультетів. Методом досліджень є вивчення соціально-екологічної ситуації міських і сільських поселень на території західної України. Joint researches of Professor Shinji Iwanaga and the staff of the Faculties of Geography and History (Department of Sociology) are due to take place in November 2017. The research method is to study the socio-ecological situation of urban and rural settlements in the territory of western Ukraine.